Wall mounting a TV is quite popular on the Gold Coast, and can make any home look more spacious and less cluttered. There are also plenty of other benefits to wall mounting your television set. We don’t recommend wall mounting your television yourself. TV sets can be difficult to wall mount and if you don’t have the experience in doing it yourself, you risk dropping or damaging not only your TV set, but your wall as well. We will ensure that the mount is correct for your television and that the wall can handle the weight of the television and the mount. 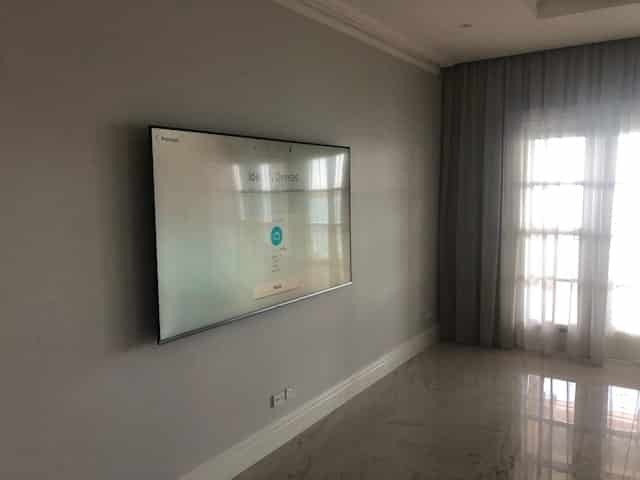 All we need from you is the location you would like your television and we will check for load bearing walls as well as any other issue that may arise from the location you choose. One of the biggest things you need to think about, is whether your cables will be hidden away in the wall or not. While it is an extra cost, certainly recommend this as it certainly provides extra security that you won’t find your child playing with the cords. There are however plenty of other options on the market. Our team has plenty of experience mounting a television in homes across the Gold Coast and we haven’t had an issue with any. Before we leave the job, we’ll have you sit down and test out the placement of your television set to ensure all is working. Along with wall mounting televisions, we also repair and replace television antennas and signal boosters. We offer a 10% quote beat guarantee as well as pensioner discounts. At Home Style Antennas, we guarantee our team will take care of your television and home when it comes to wall mounting. For us to come to you, all you have to do is call.